Biodiesel refers to a vegetable oil- or animal fat-based diesel fuel consisting of long-chain alkyl ( methyl, ethyl, or propyl) esters. Biodiesel is typically made by chemically reacting lipids (e.g., vegetable oil, soybean oil,  animal fat ( tallow  )) with an alcohol producing fatty acid esters. Biodiesel is meant to be used in standard diesel engines and is thus distinct from the vegetable and waste oils used to fuel converted diesel engines. Biodiesel can be used alone, or blended with petrodiesel in any proportions. Biodiesel blends can also be used as heating oil. Since the passage of the Energy Policy Act of 2005, biodiesel use has been increasing in the United States. In the UK, the Renewable Transport Fuel Obligation obliges suppliers to include 5% renewable fuel in all transport fuel sold in the UK by 2010. For road diesel, this effectively means 5% biodiesel (B5). Mercedes Benz does not allow diesel fuels containing greater than 5% biodiesel (B5) due to concerns about "production shortcomings". Any damages caused by the use of such non-approved fuels will not be covered by the Mercedes-Benz Limited Warranty. Similarly, a state-owned short-line railroad in eastern Washington ran a test of a 25% biodiesel / 75% petrodiesel blend during the summer of 2008, purchasing fuel from a biodiesel producer sited along the railroad tracks. The train will be powered by biodiesel made in part from canola grown in agricultural regions through which the short line runs. A test flight has been performed by a Czech jet aircraft completely powered on biodiesel. Other recent jet flights using biofuel, however, have been using other types of renewable fuels. Biodiesel can also be used as a heating fuel in domestic and commercial boilers, a mix of heating oil and biofuel which is standardized and taxed slightly differently from diesel fuel used for transportation. Bioheat fuel is a proprietary blend of biodiesel and traditional heating oil. Bioheat is a registered trademark of the National Biodiesel Board [NBB] and the National Oilheat Research Alliance [NORA] in the U.S., and Columbia Fuels in Canada. Heating biodiesel is available in various blends. ASTM 396 recognizes blends of up to 5 percent biodiesel as equivalent to pure petroleum heating oil. Blends of higher levels of up to 20% biofuel are used by many consumers. Research is underway to determine whether such blends affect performance. Older furnaces may contain rubber parts that would be affected by biodiesel's solvent properties, but can otherwise burn biodiesel without any conversion required. Care must be taken, however, given that varnishes left behind by petrodiesel will be released and can clog pipes- fuel filtering and prompt filter replacement is required. Another approach is to start using biodiesel as a blend, and decreasing the petroleum proportion over time can allow the varnishes to come off more gradually and be less likely to clog. Thanks to its strong solvent properties, however, the furnace is cleaned out and generally becomes more efficient. A technical research paper  describes laboratory research and field trials project using pure biodiesel and biodiesel blends as a heating fuel in oil-fired boilers. During the Biodiesel Expo 2006 in the UK, Andrew J. Robertson presented his biodiesel heating oil research from his technical paper and suggested B20 biodiesel could reduce UK household CO2 emissions by 1.5 million tons per year. A law passed under Massachusetts Governor Deval Patrick requires all home heating diesel in that state to be 2% biofuel by July 1, 2010, and 5% biofuel by 2013. New York City has passed a similar law. With 80–90% of oil spill costs invested in shoreline cleanup, there is a search for more efficient and cost-effective methods to extract oil spills from the shorelines. Biodiesel has displayed its capacity to significantly dissolve crude oil, depending on the source of the fatty acids. In a laboratory setting, oiled sediments that simulated polluted shorelines were sprayed with a single coat of biodiesel and exposed to simulated tides. Biodiesel is an effective solvent to oil due to its methyl ester component, which considerably lowers the viscosity of the crude oil. Additionally, it has a higher buoyancy than crude oil, which later aids in its removal. As a result, 80% of oil was removed from cobble and fine sand, 50% in coarse sand, and 30% in gravel. Once the oil is liberated from the shoreline, the oil-biodiesel mixture is manually removed from the water surface with skimmers. Any remaining mixture is easily broken down due to the high biodegradability of biodiesel, and the increased surface area exposure of the mixture. It is often reported that Diesel designed his engine to run on peanut oil, but this is not the case. Diesel stated in his published papers, "at the Paris Exhibition in 1900 ( Exposition Universelle) there was shown by the Otto Company a small Diesel engine, which, at the request of the French government ran on arachide (earth-nut or pea-nut) oil (see biodiesel), and worked so smoothly that only a few people were aware of it. The engine was constructed for using mineral oil, and was then worked on vegetable oil without any alterations being made. The French Government at the time thought of testing the applicability to power production of the Arachide, or earth-nut, which grows in considerable quantities in their African colonies, and can easily be cultivated there." Diesel himself later conducted related tests and appeared supportive of the idea. In a 1912 speech Diesel said, "the use of vegetable oils for engine fuels may seem insignificant today but such oils may become, in the course of time, as important as petroleum and the coal-tar products of the present time." On 31 August 1937, G. Chavanne of the University of Brussels (Belgium) was granted a patent for a "Procedure for the transformation of vegetable oils for their uses as fuels" (fr. "Procédé de Transformation d’Huiles Végétales en Vue de Leur Utilisation comme Carburants") Belgian Patent 422,877. This patent described the alcoholysis (often referred to as transesterification) of vegetable oils using ethanol (and mentions methanol) in order to separate the fatty acids from the glycerol by replacing the glycerol with short linear alcohols. This appears to be the first account of the production of what is known as "biodiesel" today. This is similar (copy) to the patented methods used in the 18th century to make lamp-oil, and may be inspired by some old historical oil lamps, in some places. Research into the use of transesterified sunflower oil, and refining it to diesel fuel standards, was initiated in South Africa in 1979. By 1983, the process for producing fuel-quality, engine-tested biodiesel was completed and published internationally. An Austrian company, Gaskoks, obtained the technology from the South African Agricultural Engineers; the company erected the first biodiesel pilot plant in November 1987, and the first industrial-scale plant in April 1989 (with a capacity of 30,000 tons of rapeseed per annum). Biodiesel has promising lubricating properties and cetane ratings compared to low sulfur diesel fuels. Fuels with higher lubricity may increase the usable life of high-pressure fuel injection equipment that relies on the fuel for its lubrication. Depending on the engine, this might include high pressure injection pumps, pump injectors (also called unit injectors) and fuel injectors. Biodiesel contains virtually no sulfur,  and it is often used as an additive to Ultra-Low Sulfur Diesel (ULSD) fuel to aid with lubrication, as the sulfur compounds in petrodiesel provide much of the lubricity. Plastics: High-density polyethylene (HDPE) is compatible but polyvinyl chloride (PVC) is slowly degraded. Polystyrene is dissolved on contact with biodiesel. Metals: Biodiesel (like methanol) has an effect on copper-based materials (e.g. brass), and it also affects zinc, tin, lead, and cast iron. Stainless steels (316 and 304) and aluminum are unaffected. When biodiesel is cooled below a certain point, some of the molecules aggregate and form crystals. The fuel starts to appear cloudy once the crystals become larger than one quarter of the wavelengths of visible light – this is the cloud point (CP). As the fuel is cooled further these crystals become larger. The lowest temperature at which fuel can pass through a 45 micrometre filter is the cold filter plugging point (CFPP). As biodiesel is cooled further it will gel and then solidify. Within Europe, there are differences in the CFPP requirements between countries. This is reflected in the different national standards of those countries. The temperature at which pure (B100) biodiesel starts to gel varies significantly and depends upon the mix of esters and therefore the feedstock oil used to produce the biodiesel. For example, biodiesel produced from low erucic acid varieties of canola seed (RME) starts to gel at approximately −10 °C (14 °F). Biodiesel produced from beef tallow and palm oil tends to gel at around 16 °C (61 °F) and 13 °C (55 °F) respectively. There are a number of commercially available additives that will significantly lower the pour point and cold filter plugging point of pure biodiesel. Winter operation is also possible by blending biodiesel with other fuel oils including #2 low sulfur diesel fuel and #1 diesel / kerosene. Biodiesel is commonly produced by the transesterification of the vegetable oil or animal fat feedstock, and other non-edible raw materials such as frying oil, etc. There are several methods for carrying out this transesterification reaction including the common batch process, heterogeneous catalysts,  supercritical processes, ultrasonic methods, and even microwave methods. Chemically, transesterified biodiesel comprises a mix of mono- alkyl esters of long chain fatty acids. 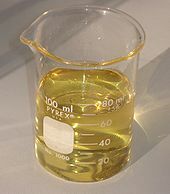 The most common form uses methanol (converted to sodium methoxide) to produce methyl esters (commonly referred to as Fatty Acid Methyl Ester – FAME) as it is the cheapest alcohol available, though ethanol can be used to produce an ethyl ester (commonly referred to as Fatty Acid Ethyl Ester – FAEE) biodiesel and higher alcohols such as isopropanol and butanol have also been used. Using alcohols of higher molecular weights improves the cold flow properties of the resulting ester, at the cost of a less efficient transesterification reaction. A lipid transesterification production process is used to convert the base oil to the desired esters. Any free fatty acids (FFAs) in the base oil are either converted to soap and removed from the process, or they are esterified (yielding more biodiesel) using an acidic catalyst. After this processing, unlike straight vegetable oil, biodiesel has combustion properties very similar to those of petroleum diesel, and can replace it in most current uses. Usually this crude glycerol has to be purified, typically by performing vacuum distillation. This is rather energy intensive. The refined glycerol (98%+ purity) can then be utilised directly, or converted into other products. The following announcements were made in 2007: A joint venture of Ashland Inc. and Cargill announced plans to make propylene glycol in Europe from glycerol  and Dow Chemical announced similar plans for North America. Dow also plans to build a plant in China to make epichlorhydrin from glycerol. Epichlorhydrin is a raw material for epoxy resins. Animal fats including tallow, lard, yellow grease, chicken fat,  and the by-products of the production of Omega-3 fatty acids from fish oil. Algae, which can be grown using waste materials such as sewage  and without displacing land currently used for food production. If the entire arable land area of the USA (470 million acres, or 1.9 million square kilometers) were devoted to biodiesel production from soy, this would just about provide the 160 million tonnes required (assuming an optimistic 98 US gal/acre of biodiesel). This land area could in principle be reduced significantly using algae, if the obstacles can be overcome. The US DOE estimates that if algae fuel replaced all the petroleum fuel in the United States, it would require 15,000 square miles (39,000 square kilometers), which is a few thousand square miles larger than Maryland, or 30% greater than the area of Belgium,   assuming a yield of 140 tonnes/hectare (15,000 US gal/acre). Given a more realistic yield of 36 tonnes/hectare (3834 US gal/acre) the area required is about 152,000 square kilometers, or roughly equal to that of the state of Georgia or of England and Wales. The advantages of algae are that it can be grown on non-arable land such as deserts or in marine environments, and the potential oil yields are much higher than from plants. However, these statistics by themselves are not enough to show whether such a change makes economic sense. Additional factors must be taken into account, such as: the fuel equivalent of the energy required for processing, the yield of fuel from raw oil, the return on cultivating food, the effect biodiesel will have on food prices and the relative cost of biodiesel versus petrodiesel, water pollution from farm run-off, soil depletion,[ citation needed] and the externalized costs of political and military interference in oil-producing countries intended to control the price of petrodiesel. Many countries around the world are involved in the growing use and production of biofuels, such as biodiesel, as an alternative energy source to fossil fuels and oil. To foster the biofuel industry, governments have implemented legislations and laws as incentives to reduce oil dependency and to increase the use of renewable energies. Many countries have their own independent policies regarding the taxation and rebate of biodiesel use, import, and production. The European Union is the greatest producer of biodiesel, with France and Germany being the top producers. To increase the use of biodiesel, there are policies requiring the blending of biodiesel into fuels, including penalties if those rates are not reached. In France, the goal was to reach 10% integration but plans for that stopped in 2010. As an incentive for the European Union countries to continue the production of the biofuel, there are tax rebates for specific quotas of biofuel produced. In Germany, the minimum percentage of biodiesel in transport diesel is set at 7% so called "B7". The surge of interest in biodiesels has highlighted a number of environmental effects associated with its use. These potentially include reductions in greenhouse gas emissions,  deforestation, pollution and the rate of biodegradation. In some poor countries the rising price of vegetable oil is causing problems. Some propose that fuel only be made from non-edible vegetable oils such as camelina, jatropha or seashore mallow  which can thrive on marginal agricultural land where many trees and crops will not grow, or would produce only low yields. From 1978 to 1996, the U.S. NREL experimented with using algae as a biodiesel source in the " Aquatic Species Program". A self-published article by Michael Briggs, at the UNH Biodiesel Group, offers estimates for the realistic replacement of all vehicular fuel with biodiesel by utilizing algae that have a natural oil content greater than 50%, which Briggs suggests can be grown on algae ponds at wastewater treatment plants. This oil-rich algae can then be extracted from the system and processed into biodiesel, with the dried remainder further reprocessed to create ethanol. Pongamia plantations for biodiesel production have a two-fold environmental benefit. The trees both store carbon and produce fuel oil. Pongamia grows on marginal land not fit for food crops and does not require nitrate fertilizers. The oil producing tree has the highest yield of oil producing plant (approximately 40% by weight of the seed is oil) while growing in malnourished soils with high levels of salt. It is becoming a main focus in a number of biodiesel research organizations. The main advantages of Pongamia are a higher recovery and quality of oil than other crops and no direct competition with food crops. However, growth on marginal land can lead to lower oil yields which could cause competition with food crops for better soil. Several groups in various sectors are conducting research on Jatropha curcas, a poisonous shrub-like tree that produces seeds considered by many to be a viable source of biodiesel feedstock oil. Much of this research focuses on improving the overall per acre oil yield of Jatropha through advancements in genetics, soil science, and horticultural practices. Biodiesel has higher brake-specific fuel consumption compared to diesel, which means more biodiesel fuel consumption is required for the same torque. However, B20 biodiesel blend has been found to provide maximum increase in thermal efficiency, lowest brake-specific energy consumption, and lower harmful emissions. The engine performance depends on the properties of the fuel, as well as on combustion, injector pressure and many other factors. Since there are various blends of biodiesel, that may account for the contradicting reports as regards engine performance. ^ a b c d e f g h Omidvarborna; et al. (December 2014). "Characterization of particulate matter emitted from transit buses fueled with B20 in idle modes". Journal of Environmental Chemical Engineering. 2 (4): 2335–2342. doi: 10.1016/j.jece.2014.09.020. ^ " OEM Statement Summary Chart." Biodiesel.org. National Biodiesel Board, 1 Dec. 2014. Web. 19 Nov. 2015. ^ French McCay, D.; Rowe, J. J.; Whittier, N.; Sankaranarayanan, S.; Schmidt Etkin, D. (2004). "Estimation of potential impacts and natural resource damages of oil". J. Hazard. Mater. 107 (1–2): 11–25. doi: 10.1016/j.jhazmat.2003.11.013. PMID 15036639. ^ Fernández-Ãlvarez, P.; Vila, J.; Garrido, J. M.; Grifoll, M.; Feijoo, G.; Lema, J. M. (2007). "Evaluation of biodiesel as bioremediation agent for the treatment of the shore affected by the heavy oil spill of the Prestige". J. Hazard. Mater. 147 (3): 914–922. doi: 10.1016/j.jhazmat.2007.01.135. PMID 17360115. ^ a b c Monyem, A.; Van Gerpen, J. (2001). "The effect of biodiesel oxidation on engine performance and emissions". Biomass Bioenergy. 20 (4): 317–325. doi: 10.1016/s0961-9534(00)00095-7. ^ Duffy, Patrick (1853). "XXV. On the constitution of stearine". Quarterly Journal of the Chemical Society of London. 5 (4): 303. doi: 10.1039/QJ8530500303. ^ Rob (1898). "Über partielle Verseifung von Ölen und Fetten II". Zeitschrift für Angewandte Chemie. 11 (30): 697–702. doi: 10.1002/ange.18980113003. ^ ASTM Standard D6751-12, 2003, "Standard Specification for Biodiesel Fuel Blend Stock (B100) for Middle Distillate Fuels," ASTM International, West Conshohocken, PA, 2003, doi: 10.1520/C0033-03, astm.org. ^ Muralidharan, K. K.; Vasudevan, D. D. (2011). "Performance, emission and combustion characteristics of a variable compression ratio engine using methyl esters of waste cooking oil and diesel blends". Applied Energy. 88 (11): 3959–3968. doi: 10.1016/j.apenergy.2011.04.014. ^ Roy, Murari Mohon (2009). "Effect of Fuel Injection Timing and Injection Pressure on Combustion and Odorous Emissions in DI Diesel Engines". J. Energy Resour. Technol. 131 (3): 032201. doi: 10.1115/1.3185346. ^ Chen, P.; Wang, W.; Roberts, W. L.; Fang, T. (2013). "Spray and atomization of diesel fuel and its alternatives from a single-hole injector using a common rail fuel injection system". Fuel. 103: 850–861. doi: 10.1016/j.fuel.2012.08.013. ^ Hwang, J.; Qi, D.; Jung, Y.; Bae, C. (2014). "Effect of injection parameters on the combustion and emission characteristics in a common-rail direct injection diesel engine fueled with waste cooking oil biodiesel". Renewable Energy. 63: 639–17. doi: 10.1016/j.renene.2013.08.051. ^ McCarthy, P. P.; Rasul, M. G.; Moazzem, S. S. (2011). "Analysis and comparison of performance and emissions of an internal combustion engine fuelled with petroleum diesel and different bio-diesels". Fuel. 90 (6): 2147–2157. doi: 10.1016/j.fuel.2011.02.010. ^ Hansen, B.; Jensen, A.; Jensen, P. (2013). "Performance of diesel particulate filter catalysts in the presence of biodiesel ash species". Fuel. 106: 234–240. doi: 10.1016/j.fuel.2012.11.038. ^ Hernández, M.R. ; Reyes-Labarta, J.A. (2010). "Reyes-Labarta". Industrial & Engineering Chemistry Research. 49 (19): 9068–9076. doi: 10.1021/ie100978m. ^ Pimentel, D.; Patzek, T. W. (2005). "Ethanol Production Using Corn, Switchgrass, and Wood; Biodiesel Production Using Soybean and Sunflower". Natural Resources Research. 14: 65–76. CiteSeerX 10.1.1.319.5195. doi: 10.1007/s11053-005-4679-8. ^ Wilcove, David S.; Koh, Lian Pin (2010). "Addressing the threats to biodiversity from oil-palm agriculture". Biodiversity and Conservation. 19 (4): 999–1007. doi: 10.1007/s10531-009-9760-x. ^ a b c Sorda, G.; Banse, M.; Kemfert, C. (2010). "An Overview of Biofuel Policies Across the World". Energy Policy. 38 (11): 6977–6988. doi: 10.1016/j.enpol.2010.06.066. ^ R. E. Teixeira (2012). "Energy-efficient extraction of fuel and chemical feedstocks from algae". Green Chemistry. 14 (2): 419–427. doi: 10.1039/C2GC16225C. ^ B.N. Divakara; H.D. Upadhyaya; S.P. Wani; C.L. Laxmipathi Gowda (2010). "Biology and genetic improvement of Jatropha curcas L.: A review". Applied Energy. 87 (3): 732–742. doi: 10.1016/j.apenergy.2009.07.013. ^ Sergeeva, Y. E.; Galanina, L. A.; Andrianova, D. A.; Feofilova, E. P. (2008). "Lipids of filamentous fungi as a material for producing biodiesel fuel". Applied Biochemistry and Microbiology. 44 (5): 523. doi: 10.1134/S0003683808050128. ^ Strobel, G.; Knighton, B.; Kluck, K.; Ren, Y.; Livinghouse, T.; Griffin, M.; Spakowicz, D.; Sears, J. (2008). "The production of myco-diesel hydrocarbons and their derivatives by the endophytic fungus Gliocladium roseum (NRRL 50072)" (PDF). Microbiology. 154 (Pt 11): 3319–3328. doi: 10.1099/mic.0.2008/022186-0. PMID 18957585. ^ Irving, P. M.; Pickles, J. S. (2007). "Operational Requirements for a Multi-fuel Processor that Generates Hydrogen from Bio- and Petroleum-Based Fuels for Both SOFC and PEM Fuel Cells". ECS Transactions. 5: 665–671. doi: 10.1149/1.2729047. ^ Park, G.; Seo, D. J.; Park, S.; Yoon, Y.; Kim, C.; Yoon, W. (2004). "Development of microchannel methanol steam reformer". Chem. Eng. J. 101 (1–3): 87–92. doi: 10.1016/j.cej.2004.01.007.